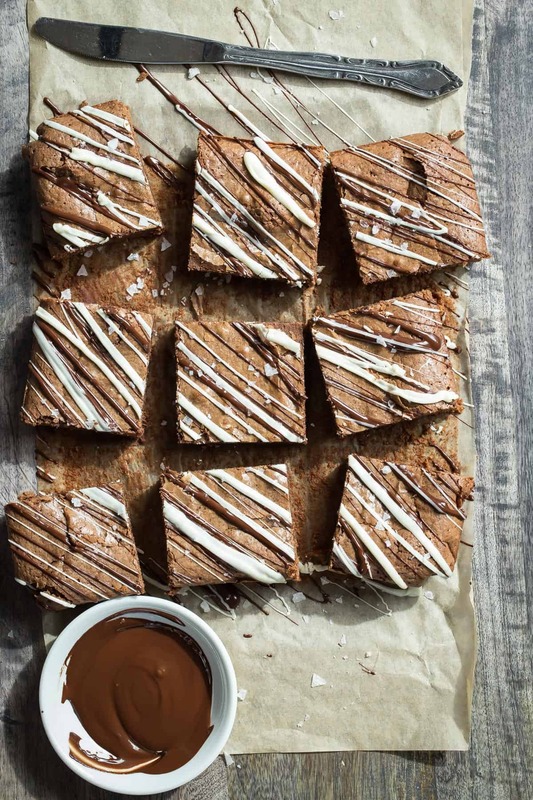 Kick up your chocolate brownies and add some chai spice to them! 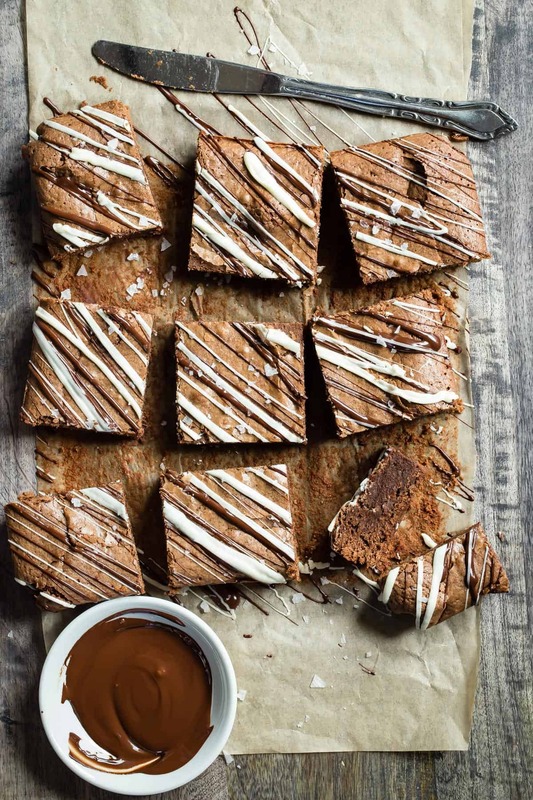 Soft and gooey double chocolate brownies with chai spice, sea salt and a white chocolate drizzle! These are my, I can’t decide if I need dark chocolate or white chocolate brownies. For the times that you need a little bit of both even if they’re mixed together. And then the giant crunchy flakes of sea salt on top. Is it just me or is chocolate and sea salt the best thing ever to hit your tongue? 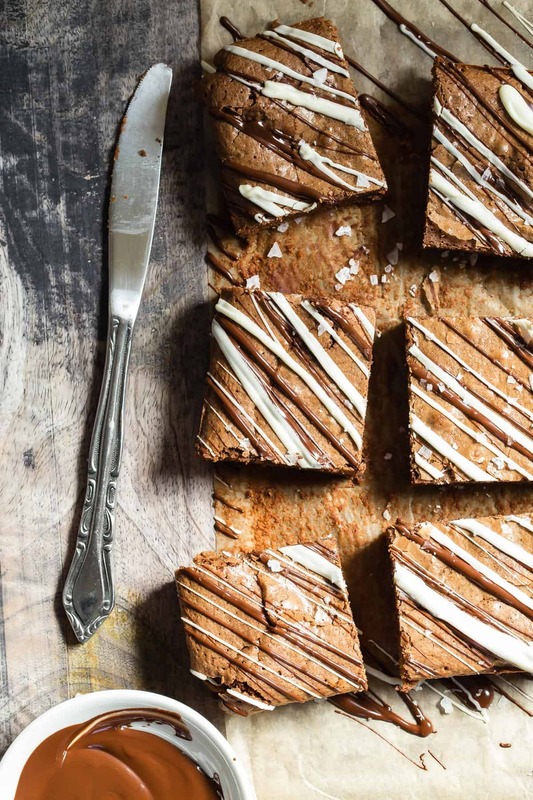 On a simple to make scale, these brownies would be a 10 (easy). You could do it with your eyes closed, I swear, but don’t because if you burn yourself you’ll be mad at me. And you should only be happy, because it’s hump day and the weekend is really starting to sound reachable. I really need that weekend and these brownies, especially the middle square. Are you an edger or a center piece brownie-picker? The middle piece is always the softest, but I get it if you like the crusty edge. In fact if you bake these for the perfect time of 20 minutes, even the edges will be on the softer side. You’ll be tempted to give them another 5 minutes in the oven but trust me. No one ever said “Those brownies aren’t cooked all the way through”. I always like to use chopped chocolate bars instead of chips when I make these, I think it melts better. You can throw so many different things in this brownie base, like pumpkin or top them with Krispy Kreme Doughnuts. Seriously! The chai spice is just chai tea. It’s super easy to find and is ground finely enough to be mixed in with the flour. See, I told you things were easy! Preheat the oven to 350 degrees F and line an 8x8 baking pan with parchment paper. In a bowl whisk together the flour, cocoa and chai spice from the tea bags. In a pan, melt the butter and add all of the chopped chocolate except for 1/4 cup. Whisk until smooth. Take off the heat and add the sugars, whisk until smooth. Add the eggs one at a time whisking well after each one. Gradually add the flour mixture making sure to have no lumps. Pour the mixture into the prepared pan and top with the remaining 1/4 cup chopped chocolate. Bake for 20 minutes and let cool. Melt both sets of chocolate chips and drizzle over the brownies. Sprinkle withs sea salt and cut into squares. These sound so delicious Gerry! Just whipped up a little something Chai spiced in my kitchen yesterday too! Such warm spices and perfect for fall! Love the extra chocolate drizzle on top! Wow chocolate brownie look great mixed with salted. Perfect recipe for family party. I really like your recipe. I’m a center piece person but I think most people are. Or maybe just the people in my house are because we’re always fighting over the center cut. Also, sea salt and chocolate is a great combo! You know how to kick up the flavor in a brownie! These sound ahhmazing! I tried this recipe tonight. The final result was delicious, but I had to modify the logisitics of the steps. It seemed weird to me at first to whisk butter, chocolate AND sugar on the stovetop. One does not simply heat sugar: it leads to cristalisation. The result of the butter-sugar-chocolate mixture looked like a pile of ground from early on. At that moment I realised I should have followed my instincts and go with my usual “brownie-making steps”. Instead of whisking all the butter-chocolate-sugar-eggs together in a warm pan, I melted the chocolate with the butter, and then let it sit to room temperature. In a big bowl, I whisked both the sugars, and added the eggs one at the time. I then poured (slowly) the chocolate mix in the egg-sugar mix using an electric mixer. I added the dry mix (slowly) to this mix, and then put to cook. This way, the sugar does not cristalise (this also keep your brownie from getting dry once it’s cooked), and you get a nice, smooth mix. For the info, the stovetop mix that I did not use sat on my counter while I retook these steps. By the end of the recipe, that mix was hard as rock. Hi Juliette, thanks for your feedback. I love the way you ended up modifying the recipe!! 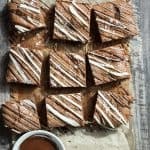 I’ve been all about chai everything lately, so give me all the brownies! I”m loving the sunlight in these photos Gerry! Also – I’m having a I can’t decide if I want dark chocolate or white chocolate moment right now too! I keep making my cookies with both! Soooo I think I’d love these brownies! + the Chai, so duh!